Virginia is a founder and President of Adelante Consulting. She is responsible for the company’s financial and technical performance and is directly accountable to its clients and shareholders. She has 32 years of technical experience in the environmental field, including air, water and wastewater, solid and hazardous waste management and cleanup, toxics, and health and safety. She spent the early part of her career with the Texas Air Control Board, which became the first entity in the U.S. to establish an emissions trading program – in Harris County, Texas in the mid-1980s for sulfar dioxide and oxides of nitrogen. She’s been a vocal advocate for carbon trading platforms since witnessing firsthand how the Houston ship channel area came into compliance with the National Ambient Air Quality Standard and how the industry made money in the process. In 2015, she became certified by the California Air Resources Board as a Lead Verifier for both its GHG Emissions Inventory program and for its Carbon Offset program. Virginia’s passion for the preservation and restoration of the environment of Northern New Mexico is not contained to her work with Adelante. 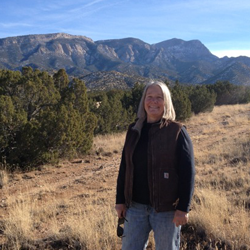 She is a founding director of the Rio Puerco Rangeland Trust and has served on the boards of the Quivira Coalition and Rio Puerco Alliance in New Mexico. In her spare time, she runs a mixed livestock operation with cattle, sheep, and goats, and she is gearing up to re-start the trail riding business she successfully managed for four years.